While ‘knowing’ suggests a fixed, established set of facts, ‘curiosity’ alludes to a perceptive and evolving inquiry. It is an open curiosity about the world, our connection to it and to each other that feeds the works in this exhibition. The works in Refiguring Worlds are anchored with references to traditional systems for knowledge and understanding –taxonomies, categorisation, documentation – but use these points of familiarity as a means to venture to more surreal, freely unchartered realms. In the process, we are invited to undo what we think we know about objects and representations of the natural world, allowing for new material and ecological narratives to emerge. 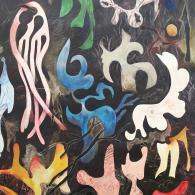 Working between painting and drawing, Sarah Davidson’s visionary works are inspired by 19th century biologist Ernst Haeckel’s natural history illustrations of flora and fauna, alongside freeform biomorphic shapes informed by various sources including the compositions of Oyvind Fahlstrom, Suellen Rocca and Hilma Af Klint. Building layers of watercolour, gouache and meticulous pen detail, Davidson’s works become porous surfaces; absorbing the viewer into a dense and dark, mysterious undergrowth. Ginette Legaré’s sculptures and installations are composed of found and manufactured objects most often associated with a utilitarian purpose. Through her practice she unpacks the notion of what it means ‘to know’ by combining these familiar objects in new ways that often defy the logic of their intended use. Legaré’s works in Refiguring Worlds see domestic implements and materials take on animalistic qualities, within modes of presentation reminiscent of a collection of specimens or curios. Ed Pien’s video Wallpaper also combines elements of the outside world with that of interior, domestic space. His pulsating video is created from collaged footage taken in his garden, capturing the blossoming cycles of plants through the seasons. Multiplied and mirrored, the images become a decorative surface design, pulling together influences from both Eastern and Western culture that Pien regularly channels in his multi-media practice. As the video rhythmically dances through various stages of budding and blooming, a transitional state between recognized taxonomical recordings is opened, creating strange cross-pollinations to hypnotic effect. Whilst writing her poetry collection Hummzinger, Maryse Larivière spent time with the Royal Ontario Museum’s collection of hummingbird specimens. In her poems and collages, bird imagery and ecological vocabulary become metaphors for human bodily and emotional interaction. Her work challenges the notion of lingual hierarchies - why is it that more weight is placed upon human language than animal language, and, should these hierarchies be removed, what might we learn from their means of communication? Through Larivière’s intimate prose and portal-like compositions we are invited to wonder. A connection to the natural world both physical and spiritual pervades the photography of Brendan George Ko. For the last 5 years, he has divided his time between Toronto and Hawai’i, gathering stories and documenting experiences of landscape throughout the archipelago. His heightened photographic images feature flora and fauna from both Ontario and Hawai’i, which through processes of post-production, appear as if from the same imagined environment. Rather than offering a traditional document of landscape, though the images may at first appear as such, Ko’s photographs manipulate the medium to summon the spirits, stories and histories within.